I do plan to release all my games on Steam eventually, but since there are additional cost to putting games on Steam, I tend to only do so with those games that are popular enough to cover the cost of the application etc. Sadly, 'Devil' hasn't managed to cover its own costs yet, so I can't conscience spending more on releasing it on other sites right now, but I have hopes my upcoming games will be popular enough to warrant it. Ah, thank you for your kind feedback - I'm glad to hear you enjoyed the secret route. Well, the story will continue in the sequel game, The Thorns of War, so I hope you will be able to enjoy more of this romance once it is released. Ah, thank you. I'm glad to hear you're looking forward to it. Hello, Xeen, sorry to hear you're having trouble. For an example on how it is supposed to work, please see the screenshot below where I've marked on the button order. So for this particular 'move', you are supposed to hit the up arrow first, the down arrow second, then the up arrow again and finally the right arrow. The buttons are on screen, selected with the mouse - I remember someone was having trouble trying to use the keyboard. 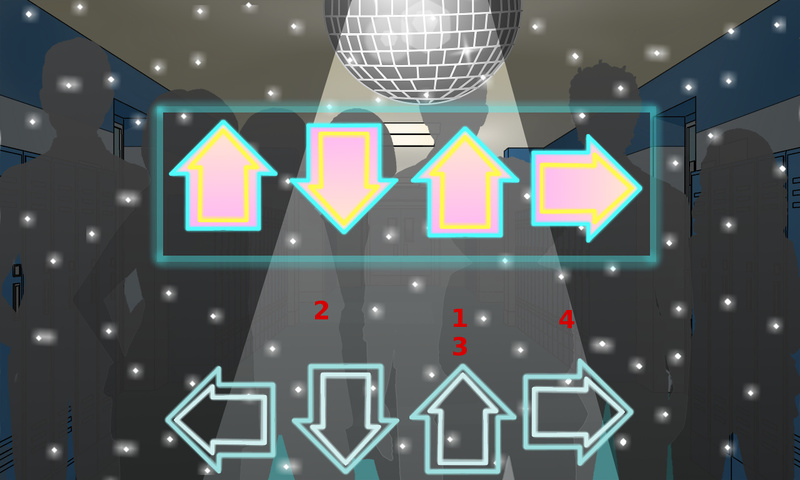 Once a 'move' appears on screen you have 3 seconds to hit the first direction button and then a second each to hit the next three directions, so trying to press them to the rhythm of the music will help you there. Hello celi-nege, I'm glad to hear you enjoyed the first game for the most part and are looking forward to the sequel. As for the name, yes, this has been mentioned before. I would say that this is a fantasy game and I never really meant for any of the names to be directly held up to real-life counterparts. I drew from a mix of French, Spanish and Italian and plain just made some of them up. As someone has already pointed out, Frederique is the feminine spelling, as well - I just prefer it that way. Ah, thank you for the feedback (and love ^_^) - I am really looking forward to sharing BFF with everyone. Ah, apologies. An android port is outside of our studio's capabilities right now, though perhaps in the future it is something we could look into. Certainly. I'll build one now (and a demo, too) and get it uploaded. If you check back in 24 hours time, I should have one available if you are still interested. I'm glad you enjoyed this demo somewhat more than the last one, though I'm not sure which copy of the demo you'd played before - as the MC, you were always trying to get Melody to a place where she is okay without you. This demo has just added some scenes where Melody is chatting with her friends, and the MC interacting with her new crowd - though perhaps having those extra scenes 'dilute' the times the MC is controlling Melody and make it seem less gratuitous. As for the weight-loss backstory story, I'm sorry to hear you have issues with it, though I do plan to go for different angle than it being 'a magical gateway to romance and happiness'. I knew a lot of girls at high school (myself included) who did lose weight thinking it would be magic bullet to their problems - my mother's favourite phrase at the time was 'I just think you'd be happier if you lost weight' - and I wanted to explore that. Melody's reasons she lost the weight are revealed in some of the routes and do not stem from her body image. At the outset of the game, she is still shy, anxious and bullied. As the game progresses, I hope to show that it is not her physical transformation, but the loss of her best friend which is the impetus for her becoming a more confident person who realises her own self-worth is not related to others' perceptions of her. Hello, Eleanore97, and thank you for the feedback. I'm glad to hear you enjoyed the game for the most part, and are looking forward to the sequel. Ah, thank you! It's always encouraging to hear people are looking forward to games. I'm not sure yet if it will be on Steam - I tend to wait to see how the game has done on itch first, since it costs money to put a game on Steam and they also take greater share of the money I make, so I need to be sure it will sell well to cover that cost. I really like itch as a site. I like the site design and the interface, and I really like the community on here. Everyone is supportive and it's easy to connect with the people who play/are interested in playing my games and get their feedback. It may sound silly, but being able to read messages like this one can really help me get over any 'writing slumps'. Many thanks for the feedback, I'm glad you are finding it interesting enough so far. This is only the beta demo, hence the lack of music, but I do have plans to add a score to the game once I have secured the budget for a musician. Many thanks for the feedback. I'm glad you enjoyed the demo so far - I have hopes to release a longer demo closer to the games release date. Right, I just downloaded all three (windows, mac and linux) with no trouble, so just to double check, was it the link on the main game page you are using or the devlog? And if using the devlog, was it #0 or #1 please? The links in devlog #0 will no longer work as they link to an older copy of the game, but those on the main page or #1 should be working. Eh, that's odd. I've never heard of anything like that before. The page and files are 'public' (as opposed to restricted access), so I'm surprised it is having trouble. Which version were you trying to download, please? Demo2? And is it for windows or mac or linux? Thank you for the feedback - I'm happy to hear you enjoyed the first game and that you're looking forward to the sequel. Thank you for the feedback and your patience in waiting for Frederique's route - I'm glad you enjoyed it so far. There will certainly be confrontations with Francesca coming up in some of the routes - though how you engage with her will be left to player choice. I'm glad you found the loveless route worth playing, as well - I think it could be very interesting route as the MC will be very close to court, but potentially without the usual family/spousal ties . It's going to be fun seeing how everyone ends up proceeding with that one. Hello, CynthiaER, and thank you for the kind feedback. I'm glad to hear you enjoyed 'Rose' and are looking forward to 'Thorns' - your comment about doing all the voices with your friend made me smile. Yes, Charlotte's route has a lot of possibilities for drama. I hope I can provide some interesting scenarios for players to navigate (without making them feel like they are being forced down any particular path ^_^). Things have been going well enough, I believe. Work on Heaven's Grave slowed down a little in December since I was working on the Thorns of War demo, but I have a major update planned for the end of this month where I hope to give the word count for Kien's finished route and possibly reveal of one of the new sprites that I commissioned for Kien and Suiza's routes. "Apologies if it seemed like I was taking your words out of context "
Thanks for the feedback, Konoi, and I'm glad to hear you're enjoying things so far. Yes, with an increased budget some of it went on backgrounds (in fact the background budget is doubled from last time) so I am glad you like the look of them. To answer your questions, yes, the questions about the children will have an influence later on, each route does have more than one ending - I'm aiming for about 3-4 at the moment - and the secret romance is... actually I think I'll keep that under wraps a bit longer, but they're male and you get the option to pursue them in one specific route (but not the single one). Things are still in the planning stages, but you should be able to get just as involved in the political situations in all routes - a shared factor in all of the demo routes was your Mother turning up and demanding you help her/the Parisi in the coming negotiations, so you'll still have a lot of influence, and how you help will be fairly different in each route with different potential outcomes. When I wrote 'in routes where you are closer to court you will know more of what has been happening in the political situation (at least, at the beginning) than if your character has been living outside of Segunda for the last two years' I was more referring to how you have a little bit more inside knowledge of how the King has been behaving in, say, Guill's route, that you do in Charlotte's for example. I'm glad to hear you've enjoyed it so far and you like the direction things are heading in. It depends on the route you are playing - the closer you are to the crown, the more influence you'll be able to have on the conflict, and I want there to be a few different ways to succeed since success is kind of subjective (for example, an ending where the Parisi are very powerful but your marriage has broken down - whether that is a success or a failure would depend on your personal outlook). The new skills will be dependant on your partner and reflect what you have picked up in the last two years. There is one for each partner and they are permanent. So say you played Leo's route first - the skill you have acquired with him will be unlocked not only for that route but for all routes you play afterwards. I have a rough idea on what I would like the skills to be, but I'll see how my ideas develop as I write the routes. At the moment I am looking at 3/4 endings for each route with variations available dependant on what you chose in the game (like having children or not as an example). You can fall in love with Guillaume in the loveless route, but not the route where you are pretending to love him. I am toying with the idea of letting you have another romance option in the loveless route (I won't say who, lol) but it will depend on how the writing goes. The secret romance is a new character. Hmm, I'm not 100% sure as I've never see it from the side of someone buying the game, but I believe if you have bought the game, are logged into itch and are on the game's page, there should be a button mentioning request key on the purchase page. There are definitely keys left, so if the button is there it should not be a problem. Please let me know if the button is not there and I'll do some more investigating. To answer your questions, kisses and shows of affection will mostly be cut away, since I plan for there to be lots of them, but of course, I will have at least one CG for a 'kiss scene' since I understand that people like them. Hmm, I'll look into the menu choice text colour and see if I can find something easier to read then. As for any typos, yes, I would hope to catch them all before the full game release, though if you want to help, please feel free to send me any you find to support@blackcross-taylor.com. Thank you for the feedback - I'm happy to hear you enjoyed the Leopold and Loveless routes. Hmm, as for the loveless path, well, Frederique feels what he has always felt, but with both their situations being as they are, I think things are more emotionally heightened. He's been away for two years imagining the worst, whereas in the single route things have just been 'business as usual' for the pair. But, as I plan things at the moment, you won't be able to romance Frederique in the loveless route. Well, Frederique's demo path is written, as is Bastien's. I am just finishing off Charlotte's route and then I can post the full demo, so you do not have long to wait now. Maybe another day or two. Ah, I'm glad you're looking forward to the sequel. Yes, we were discussing in the comments a while back how most games end with the start of the relationship - which is a nice way to conclude things, without a doubt - but it is also kind of where the story begins for the couple in question. Sure, I can give you some tips here and, if you'd like something more in-depth, you can you email me at support@blackcross-taylor.com and I can give you a full rundown. So, it can depend on who you are trying to romance, but basically following your mother's initial advice and behaving like a frivolous twit is what is going to earn you the King's favour. Off the top of my head, a few of the 'easy wins' are being all shy when you first greet Seneschal Corin, not eating at the first ball, playing the Rose Princess in the play and playing her to the script, crying when you have the opportunity. Fainting is also always a great boost for your points, lol. There are many more points available than are required to have the King choose you at the end, so you don't have to do everything right. Also Bastien mentions on Day2 and Day7 how well you are (or aren't) doing with regards to the King's favour, so that should give an indication of whether you're on the right track. Thank you for the positive feedback on both 'Rose' and 'Thorns', I'm glad you enjoyed the first game and have found enough in the demo to get excited for the sequel. Yes, it always surprises me a little when such a big decision as having children is decided for the player. I suppose it makes sense in games where it is already established your character wants them or they are needed for the plot, but otherwise I would probably avoid bringing it up or let players decide what they believe their character would want. Aha, so many people seem to be looking forward to Fred's route - the pressure's on and I must admit I'm getting a little nervous. Thank you for your feedback - it's always interesting to see what people are anticipating. Most of these points are things that will definitely be covered by the full game, so at least your curiosity will be sated eventually. Though for number 4, I can confirm that every route so far as had one or two lines reflecting who the King chose to marry Guillaume at the end of 'Rose'. They are usually from or with regards to your mother and how angry she was at the time. Of course, you're right in thinking that you will see more comments further into the game, especially when you meet the King.